This is a picture of a Queen Victoria 1899-1901 medal and a King Edward VII 1901-1902 Medal for service in the Boer War. 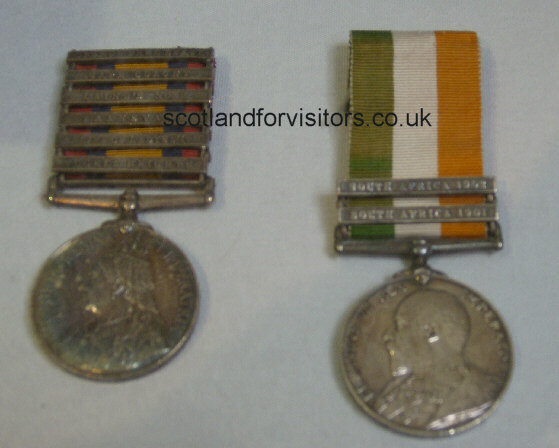 Both of these medals (which usually come as a pair) were awarded to members of the Cameronians (Scottish Rifles), the 2nd Battalion of which saw action at most of the major battles of the Boer War (1899-1902). You can see these medals on display in the regimental museum based in Hamilton, Central Scotland. This part of the collection of British Army medals which have been awarded to members of Scottish regiments. You can find other pictures of medals in the medals photographic section of this site.